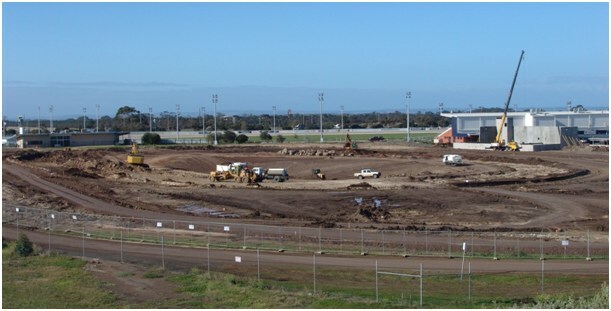 Civil Construction Projects Geelong | Hoare Bros.
We have recently won the tender for civil construction works at the Geelong Greyhound Track and have a key role in upgrading the infrastucture of the new track. Hoare Bros look forward to working in the local Geelong community and with Greyhound Racing Victoria. Work is close to final completion on the stormwater harvesting project. 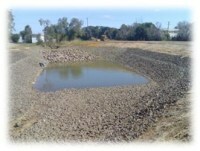 The race track dams will receive valuable water harvested from existing storm water drains. 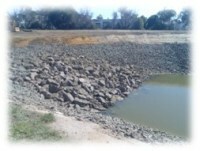 An integral part of the project was the construction of a holding dam opposite the Geelong Showgrounds. 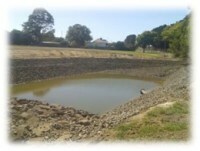 Construction of this dam was done by Heath Hutchinson who also constructed a holding dam at City of Greater Geelong’s Anakie Rd Depot – again to retain stormwater for reuse. Excavations of this nature require to good deal of skill to ensure embankments and beaching are done to specification. This is a good example of the skills held within our company. Works are well underway for the reshaping of the intersection at Pakington St and Church St in Geelong West. Quite a techncial job with conduiting being laid to the traffic lights as well as some strict management of work being done at night. Well done to those crews as working at night is quite hazardous.